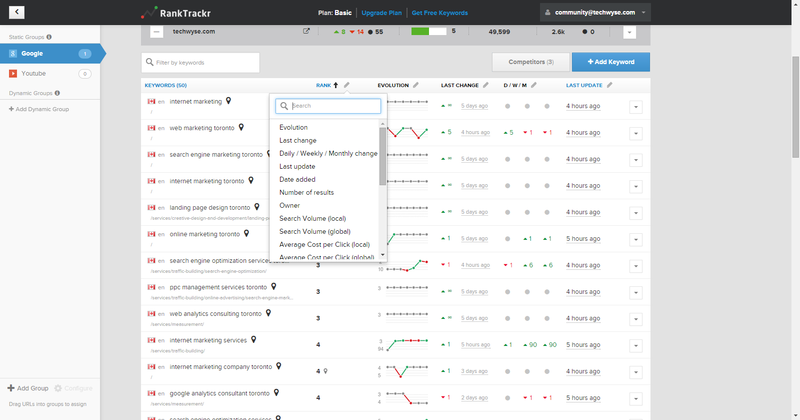 RankTrackr is a new cloud-based keyword rank tracking tool. The company claims that this is the number one growth hacking tool for SEO. The tool comes with a unique feature that allows you to track your YouTube rankings. It provides a robust API and allows you to customize your data. Choosing a reliable SEO software can vastly improve your SEO efforts. Over the years, we have used many similar rank tracking tools and some of the best we still use is WebCEO. When we came to know about RankTrackr, we wanted to share our experience with the features of this tool. In this blog, we we will be talking about the customization, accuracy, pricing, and how it compares to some of the leading tools in the industry. Before we can customize the features of this tool, we must add the specific website or keywords we want to track. This is a very simple process. After you login, click the “Add URLs” option and add the website URL in the text area. Multiples URLs can be entered here as well. 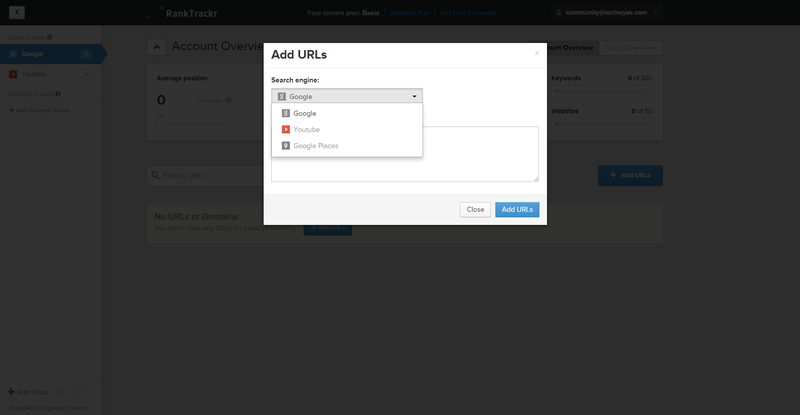 Once the URL is added, the keywords can be added from the “Add Keyword” option. The list of keywords can be added as one per line. There is an option to select the country and language. The ranking will change according to country. So, be sure to select the country your website is targeting. Add the URL that you want to track. Select your search engine under their drop down menu. Add Keywords that you are looking to track. You can also track by the city or area you are in or trying to target. 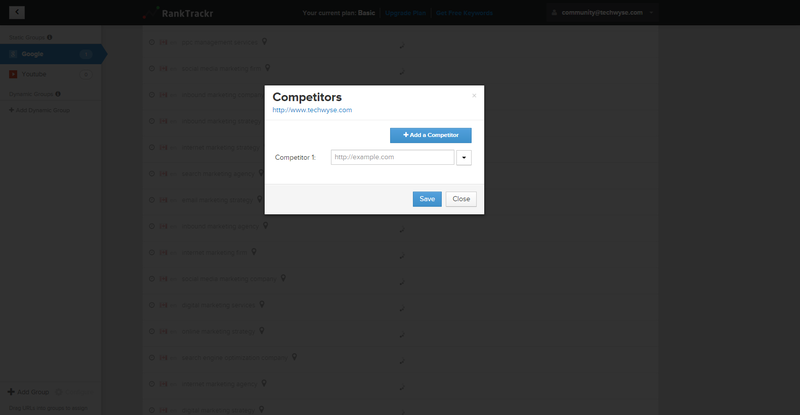 Then, you can add competitors by inserting their URL. The dashboard shows the overall status of your rankings. 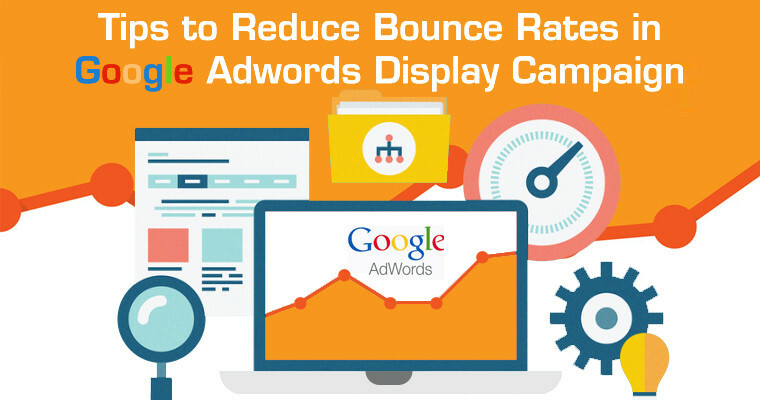 This includes information such as your average position, keyword positions, keyword change, number of keywords, and websites added. 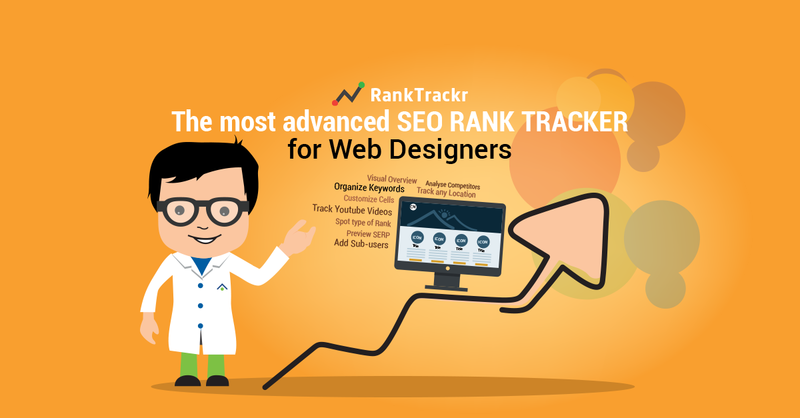 RankTrackr shows your Google PageRank, Alexa Rank, and number of indexed page. The Alexa Rank is a rank from the ranking system by Alexa.com. The amount of traffic recorded is over three months and only from the users that have the Alexa toolbar installed. Since there is a limited number of people with the Alexa toolbar installed, it’s difficult to get an accurate ranking for all your website’s traffic. 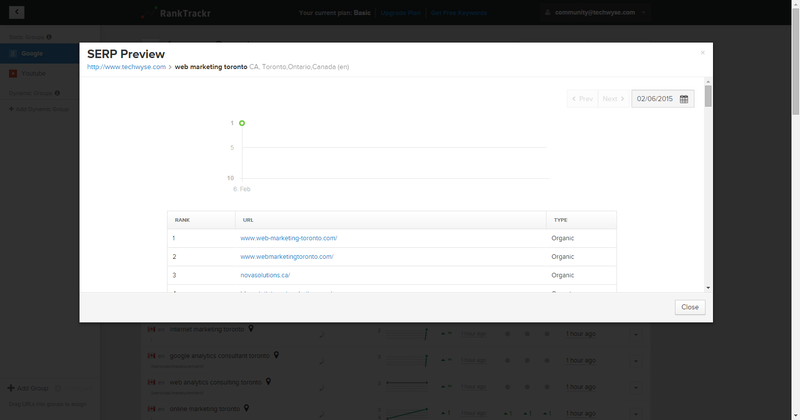 In addition, the dashboard shows the list of keywords with their rank and few other related data. The customizable cells make it easy to select and analyze the data. Based on your preference, you can customize the cell to show your Google Places ranking and even image Carousel rank. Evolution, which is the rank history, is displayed as a graph for visualization of your results. Some other cells, include your last change in ranking and your day, weekly, monthly change. This way, you can have an understanding of your overall change over a certain time period. Conveniently, the customizable columns allow you to compare your rank with competitors, search volume, average cost per click, location, language, and few more dimensions. There is an option to preview SERP for each keyword, where we can see the complete list of sites listed organically up to the 10th page. This is good option to get to know about competitor sites. 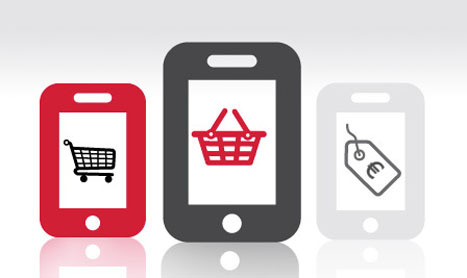 It allows you to know where you stand when compared to your competitors. There are two type of pricing package, the Enterprises for business and agency use and normal user packages. For the enterprise package, the company provides unlimited API access, interface access, and fast support by Skype. The pricing for the enterprise packages are based on the number of keywords. The packages start at $980 for 10,000 keywords to a 1 million plus keywords package. If you’re just a small-medium sized business or professional looking for a rank tracking tool, you can consider the 4 other packages offered. The starter package starts at an affordable cost of $17.60 with 100 keywords. RankTrackr offers online support to answer questions when using the tool. However, the website lacks a FAQ section. During the trial period, we received great response from the support team. They were easy accessible through emails and offered any assistance we needed. 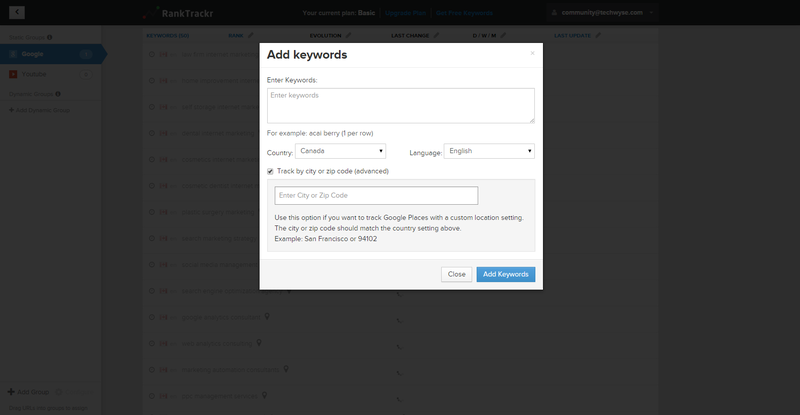 RankTrackr is a tool, which as of now, is only for checking keyword ranking. When compared with other industry leading tools, like WebCEO and AWR, RankTrackr seems to be lacking many of the great features offered by these competitors. Option to select many popular search engines. Detailed competitor rank tracking data. History of all previous ranking reports. Easy comparison and more visualization of data. Some of the industry leading tools, like WebCEO and AWR, offer the above features in their tool. In addition, they have other important features, such as backlink performance, web analytics, social media, keyword research, audit tools, and many more essential tools that are commonly used by marketers. 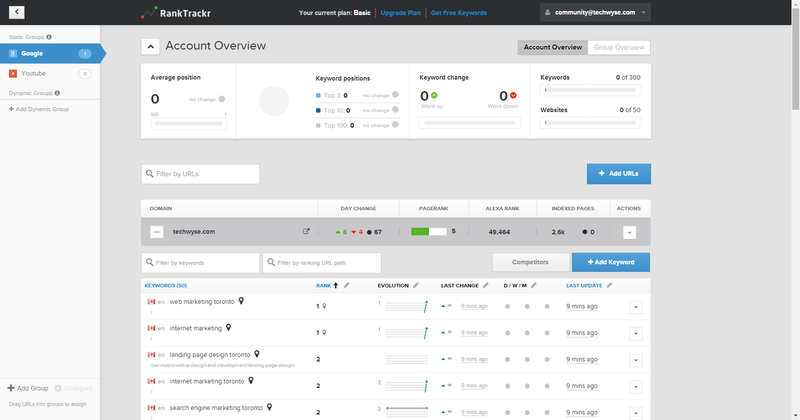 Despite some of the missing features, RankTrackr gives accurate rankings and a simple, easy to use interface. 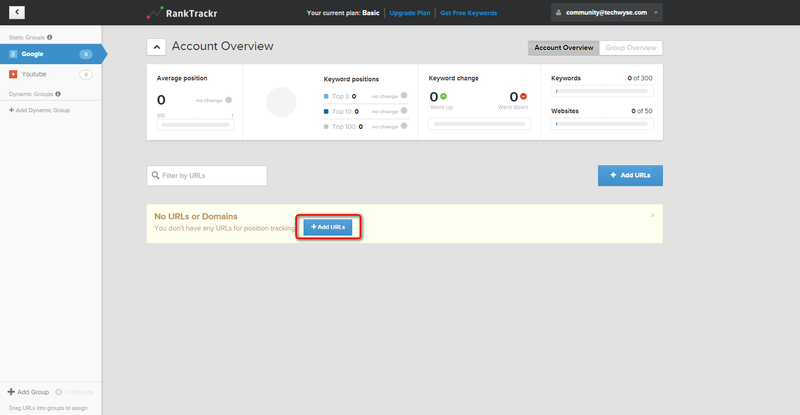 This allows any users to easily use the tool and customize the dashboard to their own preferences. If you’re looking for an affordable and reliable ranking system, RankTrackr makes for a great alternative. Give the tool a try with their free trial. Let us know what you look for in a rank tracking tool and which one you’re using in the comments below! Web CEO Rank Tracker provides more features (YouTube, local, mobile and competitor rankings etc.) at lower costs. Glad to know that you found my blog useful. Well visualized dashboard. Are they proving any unique features than WebCeo or other leading softwares? I don’t see any unique features when I compare with WEBCeo. But yes the way of visualization, adding filters and column is good. Seems overpriced for the amount of keywords you are allowed to use. We are using something at $29 and get over 1000 keywords I believe and unlimited sites. Allows competition comparison as well. Yes, When we compare with other leading industry tools, it seems overpriced.